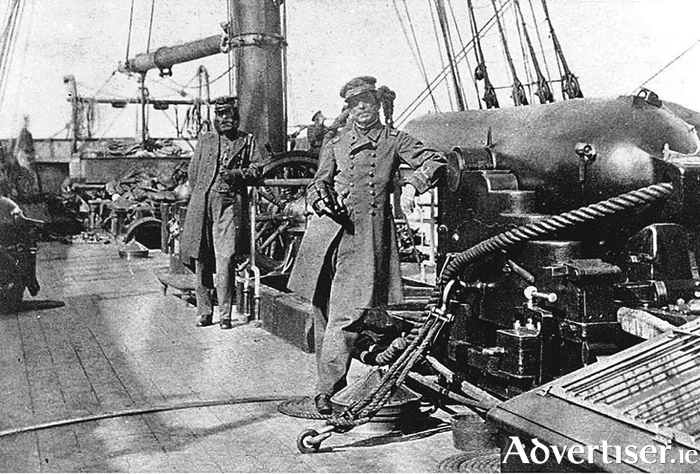 Captain Raphael Semmes, Alabama’s commanding officer, standing by his ship’s 8-inch bore gun, which brought havoc to the Union navy. Despite the challenges, dangers, bankruptcies, and in some cases, exploitation, by the mid 19th century Galway had a small but profitable fleet of sailing ships. In previous weeks I have outlined some of the achievements and failures of the Galway Line, which between 1858 and 1864 completed a total of 55 trouble free return voyages to New York and Boston. One of its ships, the Circassian, which I discussed last week, sailed from Galway on September 21 1859 to New York with 342 passengers of whom 108 were first class. One hundred and seventy persons who applied for passage were turned away as the ship was full. The Yorke family* owned a number of the largest vessels in the Galway clipper fleet, including The Gladstone, the Joseph Hinsley, the Celt and the Ocean Child. The last vessel, had built a reputation as a fast clipper on the South American guano route, before being converted for steerage passengers, with minimal comforts. In fact the Ocean Child became little better than a ‘coffin ship’ offering cheap one-way passage to America. From Galway’s harbour Guinness, Persse’s whiskey, and manufactured goods from as far away as Belfast were exported; while imports from the United States included tobacco, wheat, corn, timber and farm machinery. The imporance of Galway as the nearest transatlantic port in Europe was fully realised by the American government. As early as 1851 America had appointed Samuel W Talbot as its first vice-Consul, and he was succeeded by Thomas M Persse. While a young man Persse had worked in New York, and now used his position to boost the sales of his family’s whiskey. He was owner of the barque Bonita, which traded as a clipper on the Atlantic, and was part-owner of several other ships trading in the Caribbean, important for sugar, rum and molasses.The Persse family and their contemporaries, the McDonaghs, the Delargys, the Comerfords and the Yorkes, exemplified the Galway seafaring and maritime tradition since medieval times. After the outbreak of the American Civil War, President Lincoln insisted that all members of its diplomatic corps take an oath of allegiance. Persse found this difficult to do. Although he was reappointed consul at a later date, a new vice-consul William Boxwell West, a Wexford-born naturalised American, was appointed in August 1861. Even though vice-consul West implied, in a despatch to Washington, that ‘Galway’s streets were full of Confederates’, his suspicions were not aroused when he inspected the locally-built Hiawatha, pride of the Galway clipper fleet. It was owned by John B Purdon of Victoria Place. Surprisingly it was converted from cargo to accommdate emigrants. Yet when West inspected the boat he criticised that there ‘no mode of ventilation’, the berths were made from ‘rough boards’. He worried that the lack of ventilation would produce ship-fever and other sickness. But what William West did not know at the time, and he would have been furious had he found out, was that John Purdon had other plans to profit from the Civil War. After completing the run to New York and disembarking 132 emigrants and a cargo of scrap iron, the Hiawatha then sailed south to Nassau and was chartered as a Confederate blockade runner. Under the command of John Ballantyne, the Hiawatha made a number of successful runs through the blockade into Richmond. Considering she was a sailing ship, it was a remarkable feat to race with chasing steam boats on its tail. Poor West never seemed to have relaxed. He believed that Confederate sympathisers were attempting to enlist recruits from among the poor and homeless in Galway. But he becomes even more exercised with the disappearance of a newly launched merchantman, later named CSS Alabama. After her launch from the Merseyside shipyards of Cammell Lairds, the ship disapeared. The American authorities feared that she was on her way to serve in the Confederate navy. The Alabama, anxious to avoid American war ships, steamed out of the Mersey on an apparent test cruise, then headed at speed across the Irish Sea, where dockyard staff and visitors were hurriedly put ashore, before sailing north around the Irish coast. It possibly did make one port of call before crossing the Atlantic to meet up with Confederate forces. West and the Union authorities had every reason to be worried. The Alabama was commanded with ruthless determination by Captain Raphael Semmes who, over a period of two years, captured, burned and sank some 58 Union vessels and their cargoes, with an estimated value of more than $6.5 million. In June 1864, having sought safe harbour in Cherbourg, France, for essential repairs, he was followed by the iron hulled USS Kearsarge, which waited outside the harbour. The Alabama had no place to run. Semmes chose to come out and meet his nemesis. NOTES: *The Yorkes were responsible for building the first lighthouse on Aran, at Eochaill on Inishmore, in 1818. To aid the construction of the lighthouse tower, a powerful stallion was brought to the island to drag blocks of limestone up to the site. The stallion so impressed the islanders, who were used to the smaller Connemara ponies, that the colloquialism ‘Stail Yorke’ went into the vernacular as a byword for enormous strength. Yorke himself married the daughter of the family Wiggins, with whom he had lodged during the building of the lighthouse. They lived on Long Walk, Galway (Tim Collins ). **An ancestor Col William Persse fought alongside Washington during the American War of Independence. *** The battle was witnessed by the artist Manet, who went out to paint it; and the owner of an English yacht who had offered his children the choice between watching the battle and going to church. Again I am leaning on Transatlantic Triumph and Herioic Failure by Galway historian Tim Collins, and other sources. Did Capt John Wilson ever receive his well earned plate? Justice at last for the Indian Empire incident? Did a midsummer murder silence a guilty pilot? Did Liverpool scuttle Galway’s Atlantic dream? GBC - A Galway tradition for eighty years.